In this exercise, you will add life to a bouncing ball. 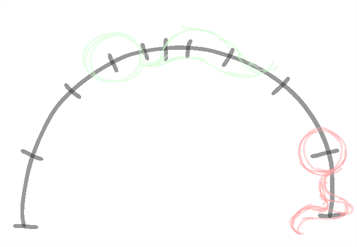 Turn your ball into a character by adding an appendage that will drag and overlap during the course of the animation. It could be a tail, ears, a cape...you choose! You can download the provided sample material for this module and use the following templates to use as a reference to compare with your final sketch. Don't forget to unzip (uncompress) the files before placing them in your library. In the Welcome screen, name your project: Ball_with_a_tail. 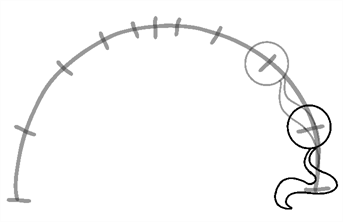 In the Timeline view, create a new drawing layer and name it: Tail_Path. Create another new drawing layer and name it: Ball_Animation_Rough. 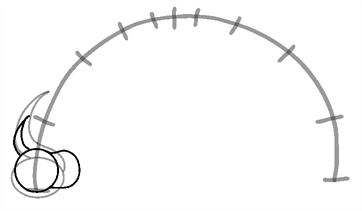 Using the Brush tool, draw the path of action for your character, including the timing in the Path element. Now you need to extend the exposure of the path cell drawing you just did. In the Timeline view, click the drawing cell, then right-click and select Extend Exposure. In the Extend to Frame field, type 24. This is the number of frames you want to extend the cell to. NOTE: If you have issues with the previous steps, you can import the 13-tail-path.tpl template. Use the Brush tool to draw the key poses for your character in the Ball_Animation_Rough layer. Start by drawing the ball, then drawing the tail. 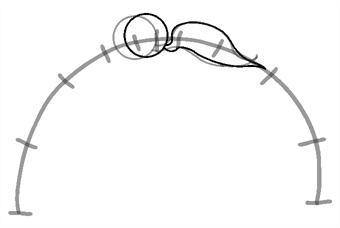 Remember, because of the overlapping action, the tail will be dragged along by the ball and should be animated to show this. In the Tools toolbar, click the Onion Skin button to see the previous and next frames of your animation, so you can draw the in-betweens. In the Timeline view, you can move the blue handles on each side to include the frames you need in the onion skinning option. Make sure to save the progress of your work by clicking the Save button. NOTE: If you have issues with the previous steps, you can import the 14-ball-animation-rough.tpl template. Play back your animation and test/correct your work. You can also activate the Loop button to view your animation in loops while noting the corrections you have to do. 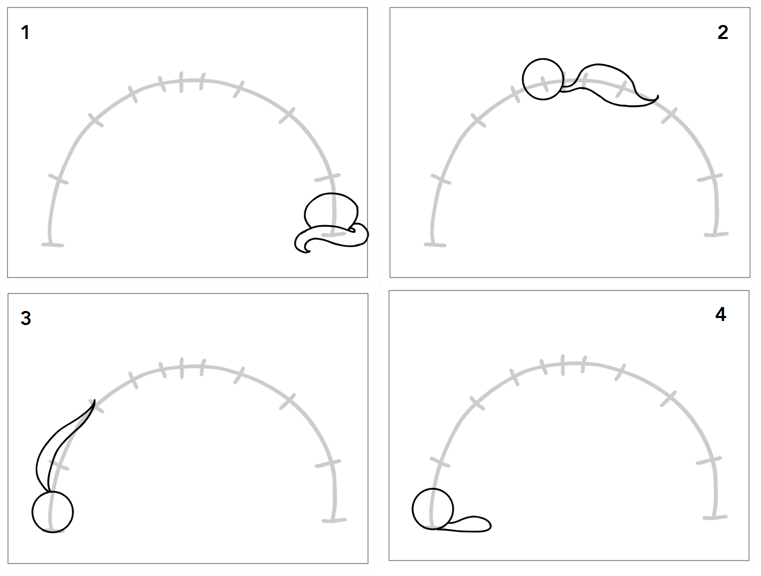 When you start an overlapping animation, remember that an element like a tail will not start moving before the ball has moved a few frames. 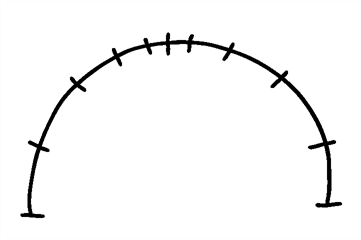 When you reach the middle of the animation, the ball will reach the peak of its climb and start to slow down. Always remember that the tail is a few frames late, so it will be squashed against the ball in the middle frame and be stretched again on the next frame while keeping the same position on the guide. At the end of the animation, the ball will stop moving, but the tail’s overlapping animation will continue until it drops to the floor. NOTE: If you have issues with the previous steps, you can import the 15-ball-animation-clean.tpl template.